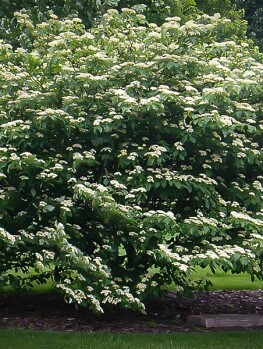 The Cherokee Princess Flowering Dogwood is the top choice for a white-flowering dogwood tree. This tree is considered the best and most attractive native flowering tree there is, and it can be grown across a large part of the country. From an early age it is covered with large, pure-white blooms that bring the garden alive in early spring, while other trees are still sleeping. The blooms are long-lasting and a tree in bloom is a spectacular sight. You will receive a second brilliant display when the foliage turns fiery shades of red and crimson in the fall. This is a perfect small tree for any garden, bringing grace and beauty wherever it is planted. 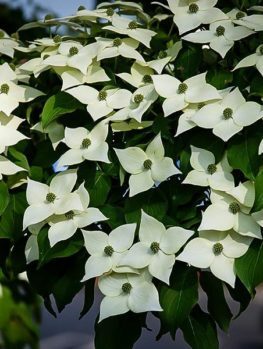 Choose a sunny or partially-shaded location for your Cherokee Princess Flowering Dogwood, in soil that is well-drained but moist and rich in organic material. This variety begins to flower when very young, so you will not have to wait long before you see the blooms, which are larger and whiter than on wild trees, as well as coming earlier in the season. 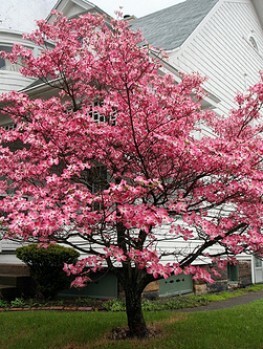 This tree requires very little attention to become an elegant addition to your garden and a joy to see. Considered by many to be the most beautiful of our native flowering trees, the flowering Dogwood bring beauty to woodlands and gardens across the country. This small tree typically grows 20 feet tall or more and is as wide or even wider than it is tall, with a graceful form that even when not flowering has great beauty and charm. 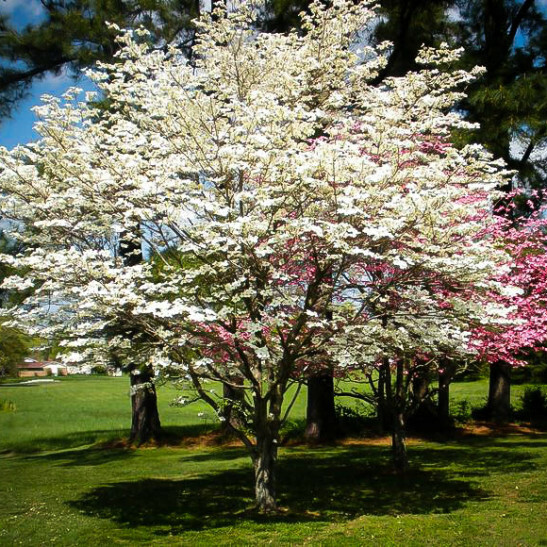 Although there are some lovely pink forms, most notably the Cherokee Brave Flowering Dogwood, for many a flowering Dogwood that is not white is not right. For those purists, it is still very worthwhile to grow an improved form of the standard tree, to get the benefit of careful selection over the years by growers and professionals. The gold-standard (or perhaps that should be the snow-standard?) 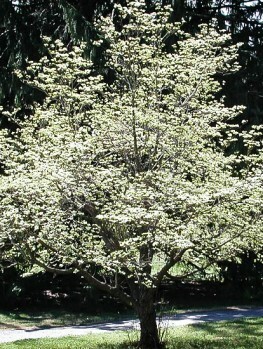 for white forms is the Cherokee Princess Flowering Dogwood. This tree shows many improvements over the wild tree. Firstly, its flowers are larger and purer white, making for an even more dramatic showing in spring. It always blooms every year with a heavy crop of flowers, so that the branches are hidden beneath the profusion of blooms. As well, it blooms a little earlier than wild trees, heralding spring with enthusiasm and optimism. Finally it will begin to flower even when the tree is still young and just developing, so that you will not have to wait several years before you get a taste of the future glory of the tree you have so recently planted. 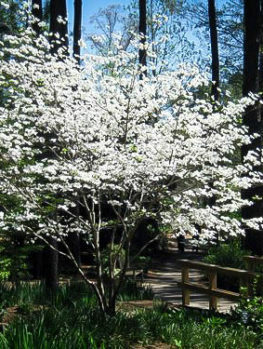 The flowering Dogwood is a native American tree, growing from Massachusetts to northern Florida and west into Texas. It is also the state tree of Virginia, Missouri and North Carolina where it grows mostly along the edges of forests and in clearings, bringing the woods alive each spring with its glowing white flowers. The flowers of the Cherokee Princess Flowering Dogwood are not really flowers at all, but four large modified leaves (called bracts). These surround a cluster of tiny true flowers, which develop into red fruits by early fall. These are not edible for humans, but are eaten by birds, so your tree will attract wild birds and help feed the wild-life in your area. Because it begins to flower when young you will not have long to wait before you have your first sight of the beauty of this tree, which will bring light and purity to your garden. The foliage, which comes out as the flowers begin to fade, is lovely too, with leaves that are dark-green, oval in shape, with prominent long veins running from base to tip. Not only is this tree a knock-out in spring, it is graceful and attractive in summer and then in fall new drama returns, with a brilliant fall display of red and crimson that will turn your garden into a blazing glory. When deciding where to plant your tree, choose a sunny location in cooler areas, and a partially-shaded one in hotter regions. 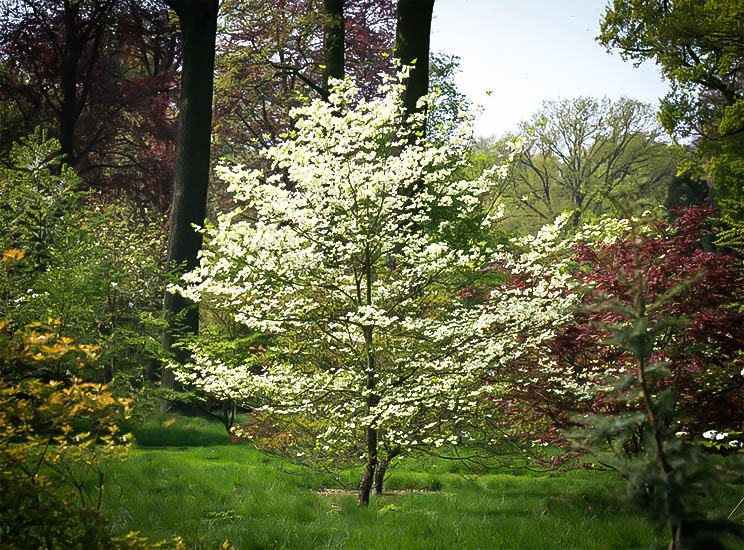 The Cherokee Princess Flowering Dogwood will thrive in most soils, but it will do best in well-drained acidic soil that has been enriched with plenty of organic material. This should be mixed in when planting and each spring it is best to also place a layer of organic mulch over the roots, several inches thick, to keep the soil cool and moist. Your tree will need no pruning, but remove any branches which die as the tree matures. Your tree will be most attractive if you avoid trimming, and instead let it develop its own natural form. 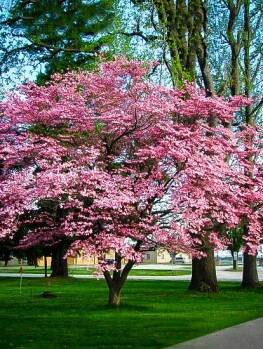 There are so many places you can plant the Cherokee Princess Flowering Dogwood in your garden. It makes a beautiful lawn specimen, alone or in a small group on a larger lawn. It can be planted behind other flowering shrubs and small trees, or planted along the edge of existing woodland areas. It looks great among trees like the Japanese Maple, or with Azaleas and Rhododendrons. A pair on either side of an gateway will give an elegant effect. Several along a driveway will make a grand entrance, or a row can be planted as a screen to great effect. 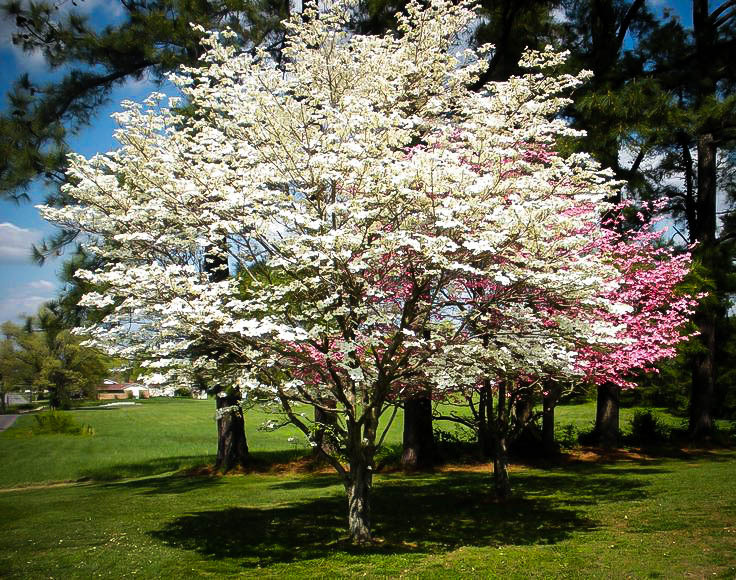 Franklin County, Tennessee, has the ideal climate for growing flowering Dogwoods, and it has been a center for both growing and breeding them since the 1940s. A famous producer was Tennessee Valley Nursery, where Ike Hawkersmith perfected techniques for growing these trees from seed, breeding and selecting the best ones. In 1950 he developed, patented, and trademarked a variety called ‘Sno-White’, which later became ‘Cherokee Princess’, to link its name to other varieties he had developed with the name ‘Cherokee’. Our trees are carefully grown from stem pieces taken from trees derived from that original variety, so they are very superior to cheaper trees labeled simply ‘white flowering Dogwood’. 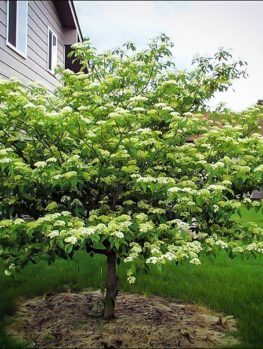 Since the Cherokee Princess Flowering Dogwood is considered the premium choice for a white-flowering Dogwood, this tree is always in high demand. We regularly receive new, top-grade stock, but our supplies are limited, so act now and order your trees, while stocks last.